I was flipping through the most recent Triathlon Magazine Canada and recognized one of the site members on his rooster sticker adorned bike. It's a piece on the Rose City Triathlon Weekend, but they used photos from Barrelman because the swim is the same. 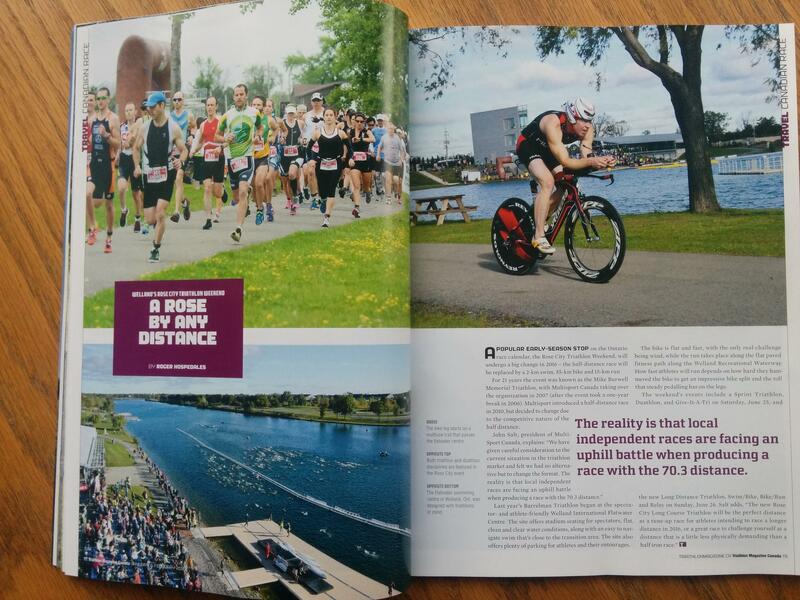 @DHansenTri, did you know you're a Canadian triathlon celebrity? I think I like the idea of disc brakes, but the wheel selection is really limited. Do you expect a lot of deep wheels to be offered with disc options? How reliant is it on UCI adoption? Throw out your P5 and cancel your Ventum pre-order, because those bikes are missing something only the Culprit Legend can deliver: a buttery smooth sales pitch by @AaronWebstey. If you enjoyed Aaron wandering the Kona expo and recording conversations for the podcast, you'll love Aaron sharing his thoughts on the Culprit Legend for their kickstarter. Just scroll down to "What Global Media had to say about the Legend at our Kona launch", where Webstey was the only English speaker with the stones to share his thoughts on multi-tool compartments and magnetic brake covers. Barrett's Privateers needs to be the fight song for TRS Racing North.